For example, a person might know that McDonald’s is a fast food restaurant that operates in 1,000’s of locations throughout the world. As you can see, this is simply base information/knowledge without any particular viewpoint in regards to McDonald’s. The affective component of an attitude relates to some form of judgment or positive/negative evaluation of the object, person, task or brand. A good way to remember this component is from the word ‘affection’ – but consider that the view can be positive or negative. Using our McDonald’s example again, the same person as above may consider that McDonald’s food is convenient and provides good value for money. This is the affective component of an attitude, as it suggests some form of evaluation. Contrast this against another person who may dislike the taste of McDonald’s view and generally dislike their facilities. The third component of an attitude is the behavioural component. As suggested by the name, this is the person’s behavior relative to the subject of the overall attitude. Using a McDonald’s example yet again, there are some people who would frequently visit McDonald’s, others who go occasionally, and others who would never go to McDonald’s. 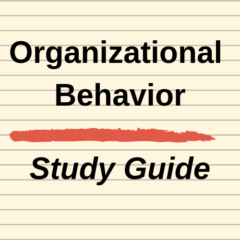 Obviously the behavioral component is interrelated to the effective and cognitive aspects of the person’s attitude.